My partner and I are avid campers. We visit the Sierras at least couple times a year and we take our camping gear very seriously. 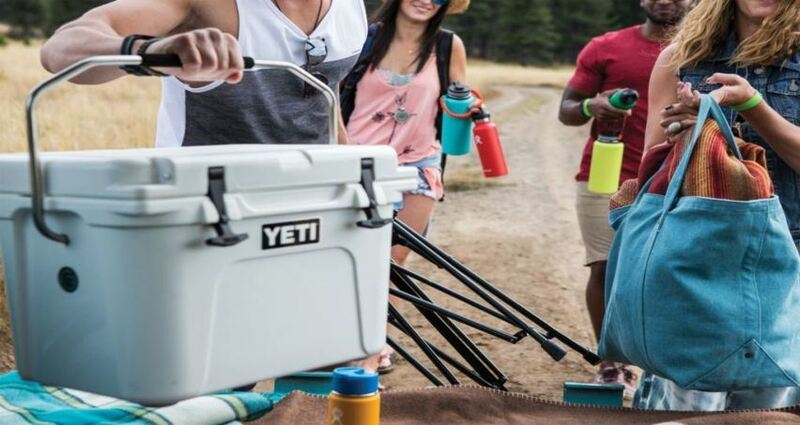 When our Yeti cooler broke after many years of loyal service, we started looking for a new one, but stumbled upon a very annoying issue – even the smallest Yeti cooler costs $200! We don’t spend that much time on the road and to invest that much money in something. That’s when I started vigorously searching for the best budget coolers. I was pleasantly surprised to find that there are many to choose from! It is possible to find a durable, portable, and high-quality cooler for every need and occasion for less than $50! Trust me, a great cooler doesn’t have to cost a fortune. Wagan EL6224 is built to accompany you on the road and keep your food and drinks at a desired temperature. The device is large enough to fit 24 liters, but still compact enough to fit into any car. Besides, it has both cooling and warming up features, yet to utilize the device, it has to be plugged into the 12v DC outlet in the car. It is not only a perfect fit for long-term road trips and can survive bumpy roads; but also, for daily, short-term use. The undeniable benefit of the Wagan EL6224 is that it works as both a cooler and a warmer. The temperature range is wide and it’s easy to set. It will cool down the drinks in 30 minutes and keep the temperature insight at – 36°F / 20° below the outside temperature; and keep food warm at 140°F. It will also keep the temperature for a while after you unplug it. It is durable and easy to transport, which makes it a perfect addition to a road trip, but you can also use it at a party, at home or in an office as a mini-fridge. It is impractical to use while in the car, as it has to be unplugged before turning the engine on and off, and plugged only when the engine is already running. Besides, it can only be used when the car is on, which might kill the car battery. 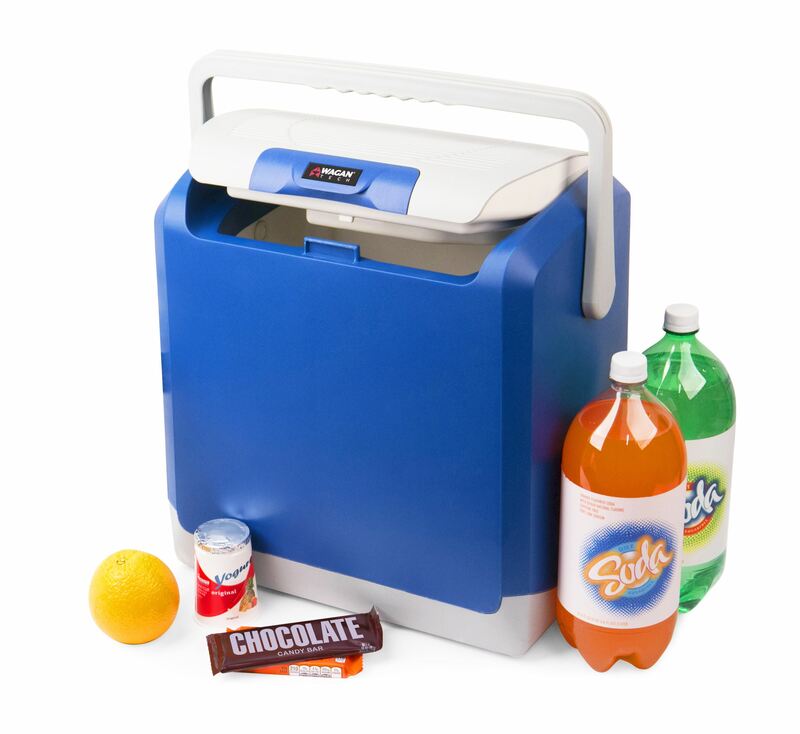 A spacious and powerful Coleman Xtreme Series Portable Cooler is indispensable for parties, BBQ’s and road trips. All you need to do is fill it up with ice and you’ll have cold drinks and snacks wherever you are. It is affordable, spacious and easy to use. However, with cheap price comes the possibility of poor quality. It is not as durable as most, so do use it with caution to prevent any damage to the chest. The Coleman Xtreme Series Portable Cooler is well-insulated and provides up to 5 full days of ice-retention even at the 90°F. The cooler is very spacious and you’ll never find yourself short on cold water on a road trip, or beer at a party. The cup holders and molded into the lid, which ensures the easy access to your drinks. It’s also portable and easy to carry. Some reports highlight poor quality of the materials, and the fragility of the chest (specifically the top and the handles). Because it’s painted black, it absorbs more sun and the ice melts faster, so it’s recommended to keep it in the shade at all times. The Igloo Polar Cooler is a solid choice to keep at home for occasional parties, at events or in the office. The ice chest is very spacious and even though it might not be the most portable option, it will surely keep a large amount of drinks cold for a long time. Yet, if you’ll decide to take it for a camping trip or to an outdoor party, don’t you worry – it’s durable enough to sustain a road trip. However, be prepared to replace ledges and handlers, as they break easy. The most spacious ice chest on the list and will fit up to 188 cans or 120-quart of volume. It’s perfect for large parties, and you wouldn’t need to worry about adding more ice as it provides ice-retention for 5 full days, even on a hot summer day. Excess water can be easily drained due to the threaded drain plug. Dual snap-fit latches secure the tight lead closure which allows you to put take it with you wherever you need. This ice chest might not the be greatest for long-term road trips, as it large and takes up a lot of space. Latches, break easy so be prepared to change them to something more durable. 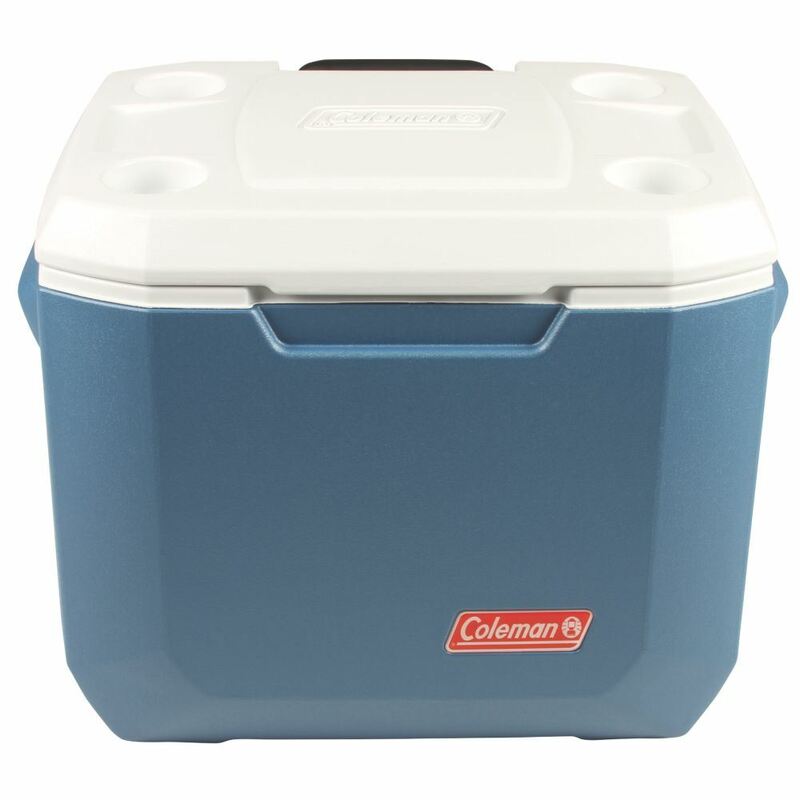 Coleman 70-Quart Xtreme cooler is the perfect representation of a “good quality at a reasonable price”. The cooler comes at only $40 but it seems to exceed all expectations. It’s rather spacious and does keep ice for several days. However, just as earlier discussed Coleman cooler, the plastic parts of the chest break easy. Despite low price, chest has extra insulation in walls and insulated lead. The lead is reinforced and supports up to 250 pounds, which allows you to sit on it. Cooler is environmentally friendly: it’s made with low CO2 insulation, for reduced carbon emissions. It is rather fragile and breaks easy. Extra insulation in the walls does not ensure 5-days ice retention – it lasts only for a couple days. 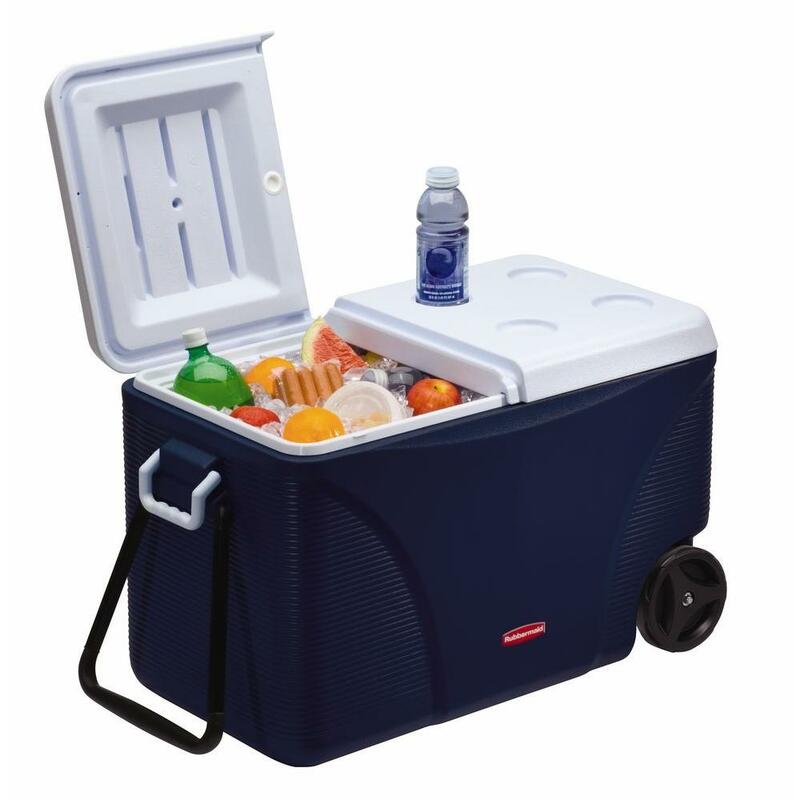 This rolling cooler is a real catch for avid campers, large families and friend groups. It’s the second biggest cooler on the list and accommodates up to 130 cans + ice, and tall enough to fit cans and bottles. Most importantly though, it has wheels, which makes it extremely easy to travel with. However, the insulation doesn’t last for 5 days as claimed, thus it’s not an optimal choice for a long trip. 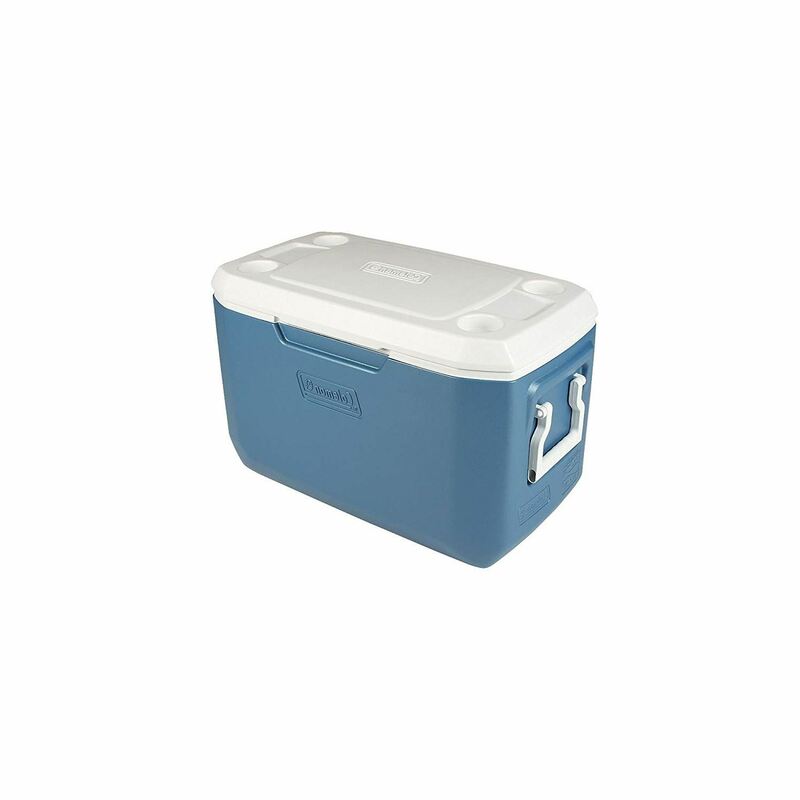 The cooler is rather large and fits 75 quarts in volume, providing enough space for food and drinks for a whole-family on a camping trip. Yet, large size isn’t a problem, due to all-terrain wheels. They are suitable for any surface and simplify transporting the cooler by a huge margin. Large size and build-in cup holders, also use to use it as a table, if needed. Alleged extra-thick insulation does not keep ice for 5 days. Ice melts way quicker. It is yet another rolling cooler on the list. It’s not the largest one, but it’s big enough to accommodate food and drinks for a family of four. It might be a great option for those who are looking for a cooler to take on a short-term family camping and beach trip. However, it is not too easy to carry around, as it’s rather bulky. And the insulation sometimes doesn’t live up to 5 days as stated. The Coleman 50-Quart Xtreme Wheeled Cooler is equipped with sturdy, heavy-duty wheels, which endure any rough terrain. Tall adjustable handle makes it easy to carry for both adults and kids. Cooler has ThermOZONE insulation does not deplete ozone, and the Xtreme 5 Technology for ice retention. It also has a reinforced lid with built-in cup holders, thus you can use it as both a chair and a table. The cooler seems to be rather “clumsy.” Even though it’s not heavy, it’s hard to carry around due to its weird dimension and lack of mobility. A very useful handle is said to break easily, while the cooler itself doesn’t keep the ice for too long. The Igloo Marine Ultra Cooler is built to endure the abuse of water. The cooler is potentially the best cheap cooler for a fishing adventure. It’s suitable for storing drinks and fresh catch. Bear in mind, that insulation is not too strong and cooler does not store ice in warm temperatures long enough to serve you at the long-term fishing trip. 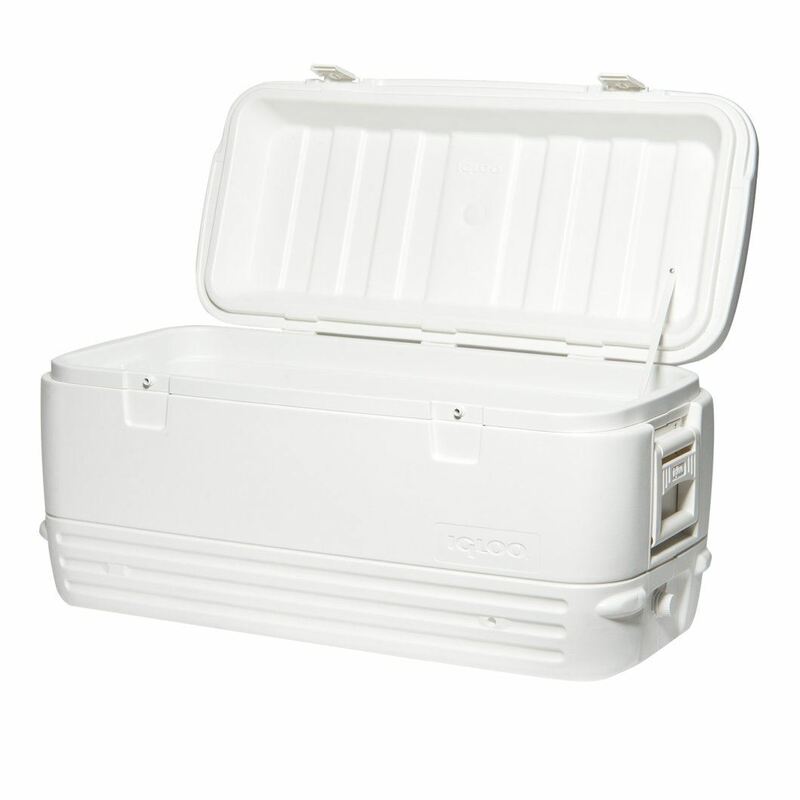 This cooler is great for short fishing trips. It is durable, sturdy and rust-resistant, able to withstand both fresh and salt water or heavy rains. It is also protected from the sun-damage due to UV protection shields. Thus, it will serve you for years. Contrary to the description of the item, the lid appears to be not insulated, which lowers the ice retention properties. It’s not suitable for long-term fishing trips. This cooler is a part of the Igloo Cube series – first cube-shaped coolers on the marker. The cube shape does not only make the cube look cute, it actually results in ergonomically easier carrying, because your arms are way closer to your body. Even though it’s rather big, it’s relatively easy to roll around. Unfortunately, the ice inside doesn’t last for that long, but you can use it for summer parties or short trips; it will keep the ice solid for a couple days. The Igloo Ice Cube Roller Cooler isn’t the smallest on the market, but the cube shape makes it compact, while the telescoping and side handle – mobile and portable. It is a perfect option for a picnic or an outdoor party, as it has dry storage in the lid for snacks, and build-in cup holders. The ice retention of the ice chest isn’t very long – last for 3-4 days only. As with most of the rolling coolers, the handle is rather fragile. 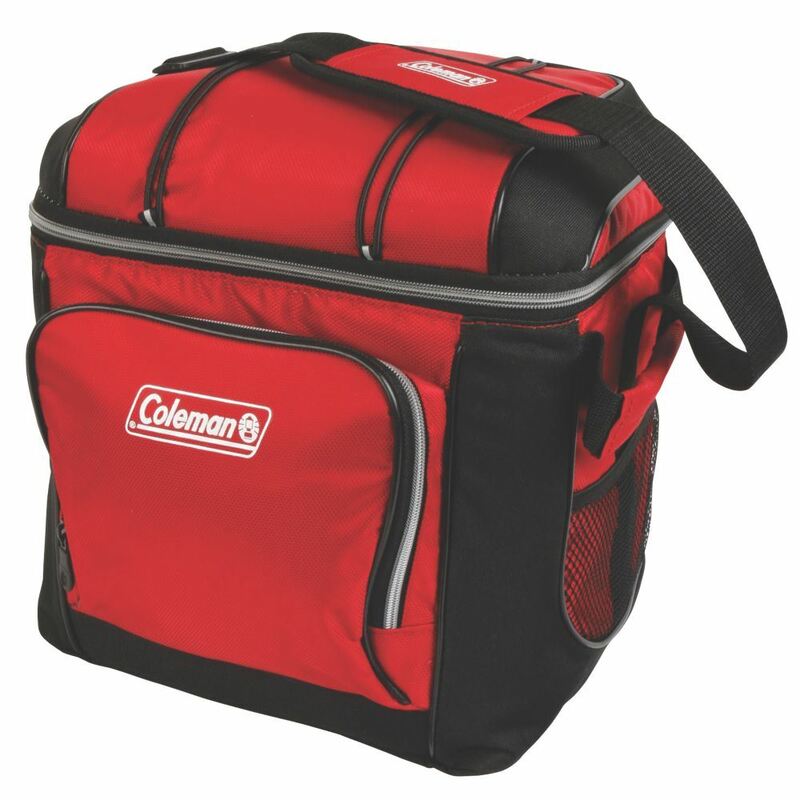 The Coleman 30-Can Soft Cooler is the option, if you are looking for an easy-to-carry cooler for daily usage. It’s very light, practical and suited for carrying food and couple beverages for lunch, picnic or beach trips, it wouldn’t be a greatest choice if you need a cooler that will keep the frozen food frozen for days. The insulation is rather low and the ice retention doesn’t last for long. An indisputable advantage of this cooler is its portability. The outward fabric of the cooler and straps is soft and gentle to the hands and body, while the inside has a hard plastic liner protecting the food from friction and shaking. Flexible lining is equipped with antimicrobial properties and protects the cooler from odour and mould. Heat-welded seams ensures leak resistance. Soft cooler has no insulation and ice melts very quickly. The OAGear Backpack cooler is an optimal choice, if you need something that you can carry for hours. 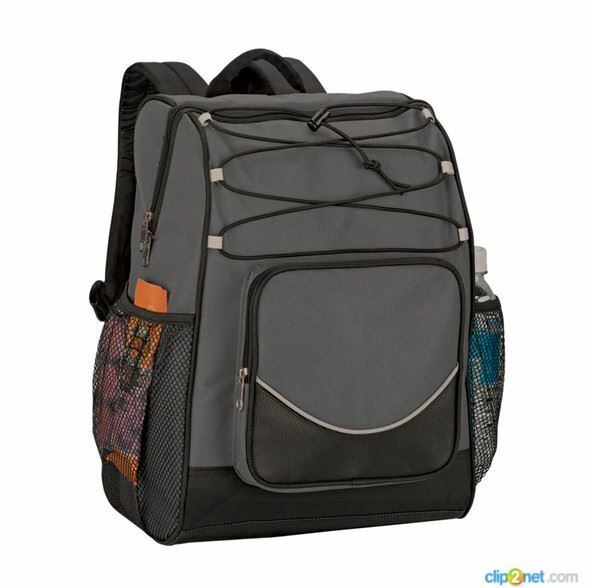 This backpack is insulated and is suitable for keeping ice, thus you can pack up fresh food with you. However, don’t expect it to keep ice intact for days – it will melt by the end of the first day. Product Dimensions: 12.25 x 16.5 x 7.75 inches. The OAGear backpack is easy to carry, hand free option to keep food and drinks cool and fresh for a day. It has plenty inside room for such a small cooler. The heat-sealed liner provides resistance to leaks. No ice retention. Ice packs melt quickly. Buyer’s Guide – What to Consider while Choosing the Best Budget Cooler? When searching for a cooler, we all want one that keeps the inside cold for days, is durable, sturdy, lasts for years and is fairly cheap. This all sounds great but is actually nearly impossible to find. As you can see, there are many cheap coolers on the market for every occasion, season and personal preference. To choose the perfect cooler, you need to determine what size you need, what you are going to use it for, and what is the occasion or event you plan to take it to. Coolers don’t have to be large and clumsy. 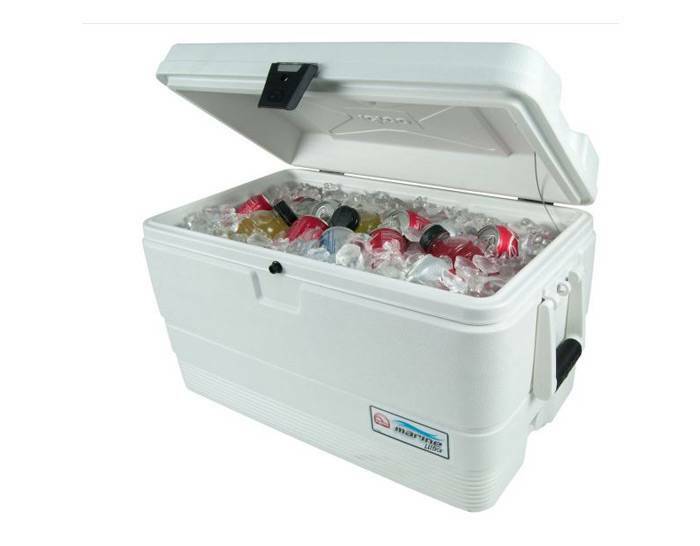 There is a cooler for those who throw large parties every weekend, or going solo on a backpacking trip. Thus, while buying a cooler first thing you should consider is how big you want it to be. Think what you want to use it for and for how many people. If you have a large family and often attend large sport events, picnics or outdoor weekend trips, go for Igloo Polar Cooler. Yet, such a large cooler is not useful for you if need something to put in your car to keep your drinks cold on the road. You can choose from middle-sized and non-wheeled options. There are both rolling and fixed coolers, and while wheels undoubtedly make coolers mobile and easier to use, they aren’t always necessary. If you plan to keep your cooler at home or in the car you might not need wheels after all. Fixed coolers are more stable, and even the largest one of them can be easily placed in the trunk or car seat without fear of it moving around and destroying the contents. While having rugged wheels does not exclude stability, such coolers are way more comfortable to use when you expect to move around on foot a lot and planning to carry a lot of food and water with you. Most mobile one, however, are those made of soft fabric. Extremely light and easy to carry they have almost no stability and provide little to no retention. Maybe the most important feature of the cooler is the ice retention that it provides. Most of the coolers are said to keep ice for up to 5 days, yet this is rarely the case. Most will surely keep the ice for only 3 days and then you’ll need to add more ice. For some, using coolers for a couple days is more than enough, but if it’s not, go for the Igloo Polar Cooler. However, if you take long road trips often, especially into the wilderness, with no chance to grab more ice, you might want to consider taking the electrical Wagan EL6224 cooler instead. No ice is needed and the drinks will stay just as cold. Most coolers are made of plastic, which makes them particularly sturdy and rigid. Others are simply made of fabric, which increases the comfort of use and their mobility. While choosing a cooler consider for what occasion you’ll be using it for. This will help to understand how durable it should be. On the road every weekend, have camp fires every now and then or throwing wild parties, prioritize durability and sturdy materials: go for plastic coolers with reinforces lids, no wheels. These coolers survive long drives and keep the food and drinks cold for longer. If you require a smaller, lighter and more mobile version and don’t need long ice retention, choose plastic ones with wheels or even soft fabric. As a matter of fact, it is relatively easy to find a high-quality and affordable cooler. If you don’t want to go broke and striving to find the best cooler under $100 focus on the Coleman and Igloo brands. 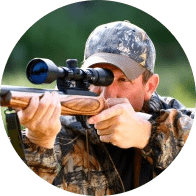 They are just as well known and of the same quality as Yetis, but are a lot more affordable. They have many reliable options for many occasions. 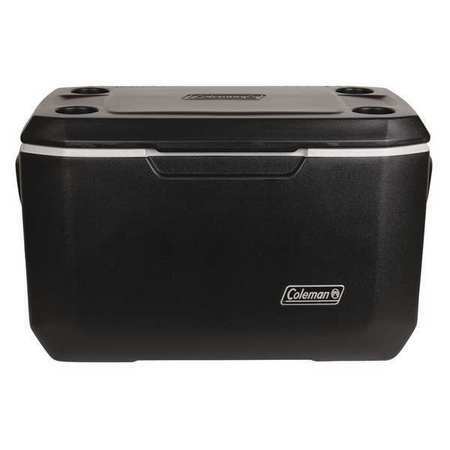 For example, Coleman Xtreme Series Portable Cooler – a sturdy, extra-insulated cooler can be used for both road trips and large home parties and it goes for just $60. Igloo Ice Cube for instance costs less than $30 and is great for those prioritizing mobility over sturdiness, as it is spacious, but portable and easy-to-use wheeled cooler. Choosing a great cooler isn’t as hard as it might seem. The key is to understand what you need it for and how you are going to use it. Things you should focus on are the size of the cooler, its stability and durability, as well as ice retention. Our top pick for the best budget cooler is the small but powerful Wagan EL6224 because it is electric and requires no ice to cool of drinks, or the need to warm up the food. The best mid-sized one is the Coleman Xtreme (70 quart) – an easy to carry, portable option with long-lasting ice retention. 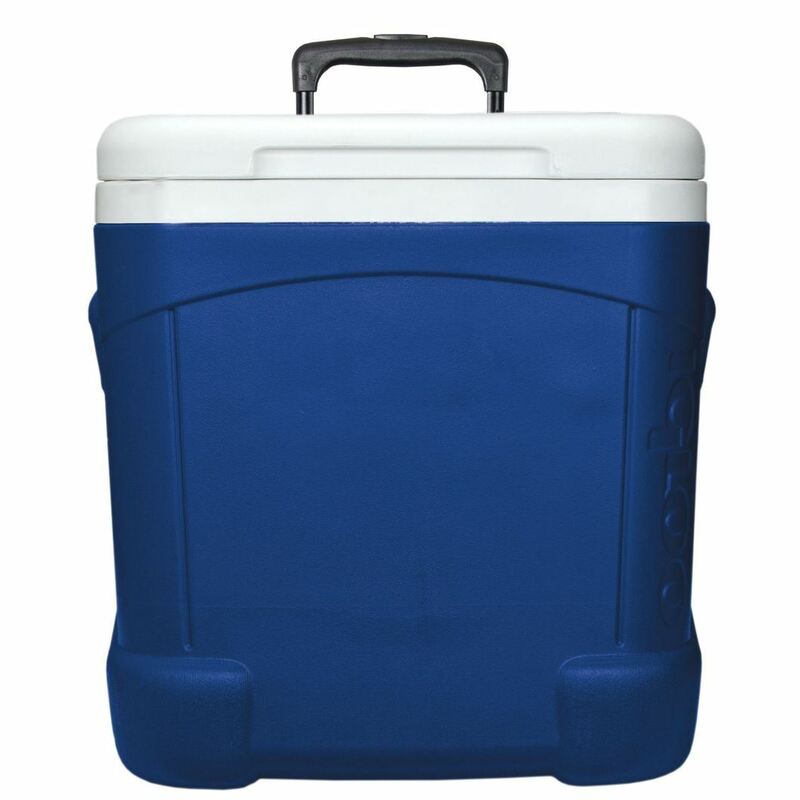 The best large cooler for big parties or camping trips for a large group is undoubtedly the Igloo Polar Cooler.